This tab displays monitoring statistics for the current monitor selected in the Monitor List. Use the From and To date-time pickers to specify the period to calculate and draw statistics for. 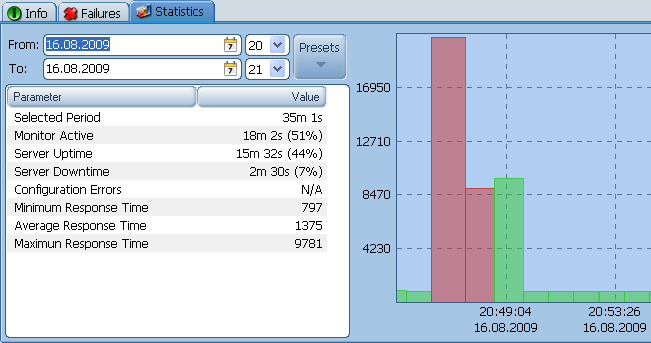 Use the Presets button to quickly show statistics for the predefined time periods: Today, Yesterday, This Week, Previous Week, etc. Select a region on the chart with the left mouse button to zoom in. Use the reverse selection to zoom out. Hold the right mouse button to pan. Use the mouse wheel to zoom in and out. Move the mouse pointer over the red chart bar, to see the descriptive hint about the failure, including the full check logs (only if this failure is present in the Failures tab).